My snowman is wearing a scarf and although his hat may be more for show than warmth his little birdy companion has gone for the full woolly pompom affair. 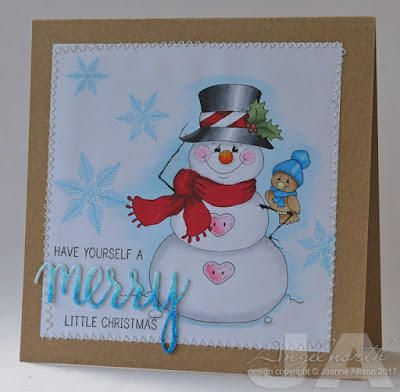 This is a hybrid card - the snowman is a digi (printed with a laser printer and coloured with Copics), the snowflakes and part of the sentiment are stamped. The die cut "merry" was covered in glitter and then given a bit of an ombre effect with Copics. Love it. Your snowman is so jolly!